SimpliSafe employees demonstrated outside their offices recently. Workers at a Boston home security company have filed a class action lawsuit, seeking to recover unpaid wages. The complaint, filed Monday in Suffolk Superior Court, alleges that employees at SimpliSafe were not paid adequately for overtime, breaks, and training sessions. “Defendants have violated the Massachusetts wage laws by failing to pay their hourly employees for all hours worked, failing to pay minimum wage, and failing to pay time-and-a-half for overtime hours,” the suit states. The three plaintiffs in the case — Abraham Zamcheck, Ryan Costello, and Lauren Galloway — worked in the company’s call center. They were recently suspended after protesting the company’s handling of a bedbug infestation, claiming the office was sprayed during working hours. The company has denied the allegation, saying treatments were applied after business hours. 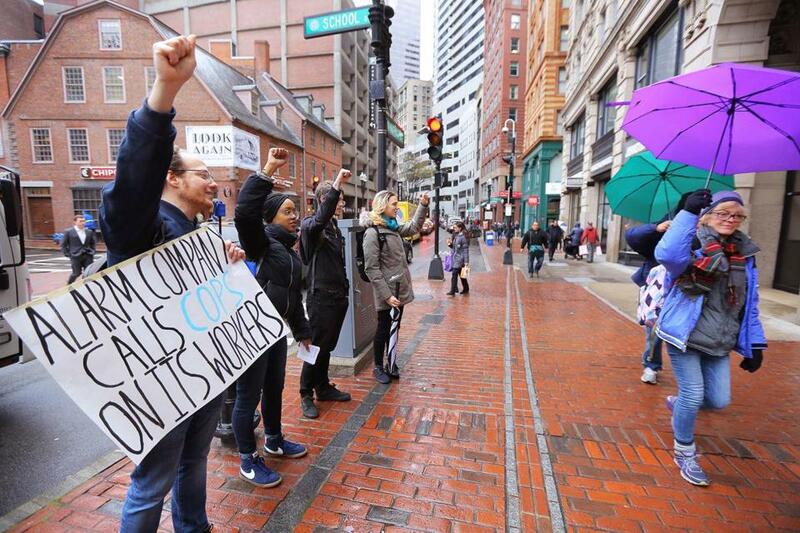 The suspended workers have recently demonstrated outside the company’s headquarters in Downtown Crossing, saying management’s handling of the bedbug problem signified broader issues. A spokeswoman for SimpliSafe said the company was reviewing the complaint.